Orion Pictures is set to release the controversial remake of the iconic horror classic Child's Play on June 21st, 2019. The announcement was made earlier today by John Hegeman, President, Orion Pictures. This puts the remake on the same release date for Disney and Pixar's Toy Story 4, which is also the same date as The Grudge reboot. While the animated family movie more than likely won't be in direct competition, The Grudge reboot will definitely be, and it might be a pretty big roadblock for the already divisive Child's Play remake. The Child's Play remake follows a mother who gives her son a toy doll for his birthday, unaware of its more sinister nature, which is the same premise as the original movie. The remake of the iconic horror classic stars Aubrey Plaza (Ingrid Goes West) as Karen, Emmy and Tony nominee Brian Tyree Henry (Atlanta) as Mike and Gabriel Bateman (Lights Out) as Andy. Rounding out the cast are Beatrice Kitsos (Fox's The Exorcist), Ty Consiglio (Wonder) and Carlease Burke (Jumanji: Welcome to the Jungle). 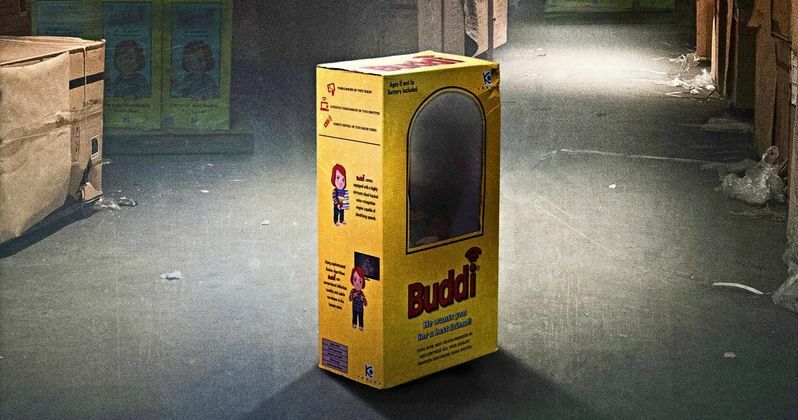 The Child's Play remake poster is pretty simple and just shows off Chucky's box in a factory. You can only see the Buddi doll's hand in the picture, making it rather unremarkable, especially since there's so much open space. The main attraction that the poster boasts is that it's from the producers of Andres Muschietti's big screen adaptation of Stephen King's IT, which is being used as a selling point. However, many horror fanatics are not happy that the franchise is getting the reboot treatment since creator Don Mancini is still making original content. Mancini has no involvement in the remake and is also not very happy that it's happening. Director Lars Klevberg has said that Child's Play was the movie that got him into the horror genre. Since then, he has revealed the first look at the new Chucky doll, which received mixed reactions from fans of the original franchise. Taking what Don Mancini did with the first Child's Play and trying to improve it is almost blasphemous to certain horror fans, especially since Mancini is currently developing a TV series revolving around the iconic Chucky doll. With that being said, let's hope that Mancini at the very least gets a huge paycheck for the remake. Rising filmmaker Lars Klevberg (Polaroid) is directing the Child's Play remake from Tyler Burton Smith's screenplay, which is based on the original movie. David Katzenberg and Seth Grahame-Smith produced under their KatzSmith Productions banner. The duo produced last year's smash hit remake of IT, the highest grossing horror film of all time bringing in $700 million at the global box office. Aaron Schmidt and Chris Ferguson executive produced. It will be interesting to see how well the Child's Play remake does at the box office, especially on such a crowded release date. You can check out the poster for the remake below, thanks to the Child's Play Movie Twitter account.